Islam for Europeans – Refugees Welcome? 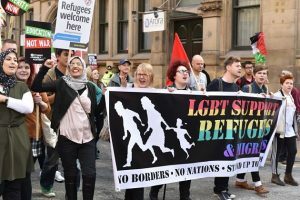 Regarding this new definition of “refugees”, I might sound controversial, but seeing the big efforts being made by Islamic societies in pro-refugees campaigns, I wonder, how is it exactly an Islamic issue? How, exactly, promoting the migration of Muslims to non-Muslim western countries (mostly dreaming of welfare paradises) – especially with the huge rates of riddah or at least indulging in forbidden activities – is in any way conductive to the greater good of “Islam in the western world “? This, especially when Russian propaganda is clearly behind this new sudden psychosis about “refugees” (when the numbers are not so high, and nowhere near the millions of Algerians, Turks, Moroccans, Albanians etc who migrated to Europe in the past decades), and now more than ever, it would be a good idea to separate the issues of religious rights of Muslim communities in western countries, from the issues linked to immigration and foreigner immigrants (who, unlike USA and UK are very often involved in crimes and many unpleasant activities, and generally give a very bad impression of “Islam” in the eyes of non-Muslims, and I’m talking about haram activities, not about “the islamic practices scare the mighty superior Europeans, so let’s drop them and assimilate amongst them”). Rather, it would be far better to campaign for their temporary settlement in nearby Muslim countries, or even places such as Malaysia, rather than having them risking physical death trying to reach a place where they will risk death of iman. Or even better, campaigning for the removal, with any means necessary (even if it was by USA, NATO or Zionists, who cares: alawis, baathists and Russians are even worse than them anyway), of Asad, so that those people won’t even have anymore the reason to flee their houses, in the first place..
3. Links the presence of Islam in Europe (which is centuries old), with the recent (and heavy, unfortunately) problematics of recent times immigration. This is yet another example of our need to come up with our own original elaborations on the issues we face, instead of being pushed into taking a side just on the mere basis of what those who appear to be our “*open* opponents” say or do. Our positions need to be grounded on an honest, insightful, independent evaluation on the basis of our own sources and interests, and stemming from our own intellectual and scholarly legacy, without any shackles of foreign ideologies, nor pressed by the contingent interests of this or that side – be it left or right – who comes from a wholly different perspective, from which we should remain far. Aware, but independent. Can’t tell you how glad I am for this fresh view on things – I agree with your assessment 100%. And I am an immigrant Muslim from the second wave of the 80s. Keep putting these things out there – people need to hear it. Saalams brother. I am really glad others have been thinking about this as well. I have been reflecting on this and telling others about this for a while. Muslims need to understand this and get a whole of this understanding fast. Wa aleykumu as salam and thank you both.